We approached him and a sweet, bubbly conversation ensued. I could tell that he loved Mohanji’s energy instantly. He told us his name – Swami Yogananda, disciple of Swami Paramananda Giri, a great Master whose ashram happens to be right across the street from Siddha Ashram. Yogananda told us we should definitely meet his Master who comes to Haridwar only twice a year and that too for only three days (this time due to Kumbh Mela). He spends most of his time in their other ashrams and abroad, since they have a very big following in Russia. He told us: “Why don’t you come and meet my Master. He is a Self-realized being.” Mohanji said: “OK, no delays. 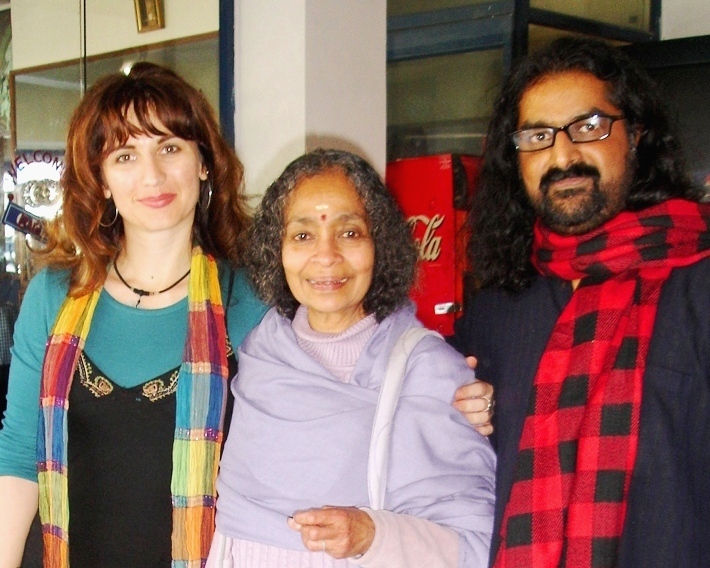 Let us then go right now.” Two other ladies from France, Elisabeth and her daughter Marie, who both connected with Mohanji and myself deeply as soon as we first spoke, were happy to join us as well. 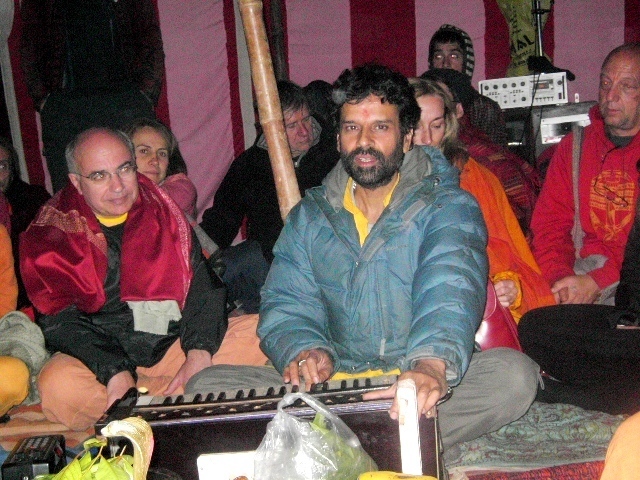 Within two minutes, we reached the area of the ashram where the enlightened Master Paramananda sat on a small stage, with many people seated at his feet. As soon as we arrived, Swami pointed out to the people in front of him to make space for us – we thus got to sit right in front of him! That indeed was a great honor, so unexpected. Surprisingly enough, nobody complained about giving up their precious ‘front row seat’ and all seemed very happy. As soon as we bowed to Swamiji seeking his blessings, I felt that my whole being was smiling – great joy was bubbling out of me for no apparent reason. With folded hands I requested Swamiji to bless us to do greater, more effective Seva for humanity. I told him that, at present, Mohanji is teaching meditation, that we are doing whatever charity work we can in our free time, but feel that is not enough. He gave me a very warm smile and blessings, paused for a while with eyes half closed, and I could tell that he is ‘scanning’ us through his third eye. The atmosphere was all charged up and we couldn’t get enough of this loving Swamiji’s vibes. However, we didn’t want to be selfish as there were many other people who waited for their turn. We thus left with a final blessing. There was something so exciting and liberating about being in a place filled with so many Self-realized Masters, approaching them in the most unassuming way. I loved the fact that Mohanji and I had nothing to prove and that, while being 100% natural, things were just unfolding on their own. I now understood experientially the point he explained to me earlier – we are in unconditional service of the Guru Tatwa, the very Guru principle that we all carry within us. Therefore, those who have ‘the eyes to see’, the Self-realized beings, will naturally appreciate the unconditionality and innocence of our approach. There is no pattern, no role play, no reputation to protect – we are simply flowing like a river, open to the grace. 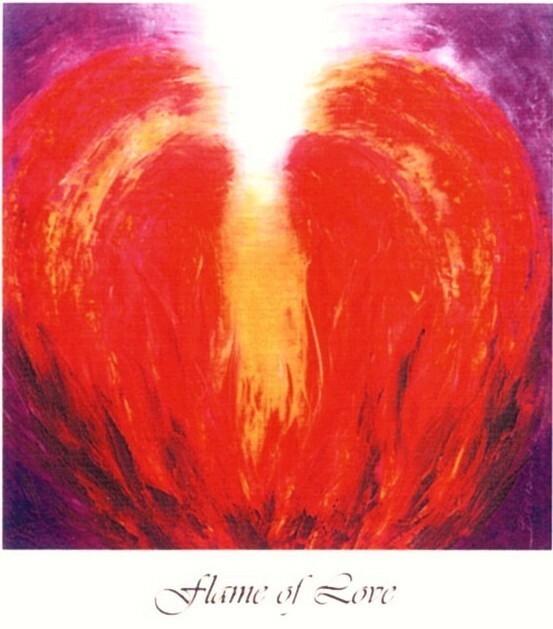 This is what I always wanted my spiritual path to be like – my heart, indeed, was full! We returned to Siddha Ashram right on time for a delicious dinner – what a day! Before retiring to sleep, Mohanji told me that his connectivity with the Avadhoota still continues. At one point, I witnessed him entering into telepathic communion with the mighty Avadhoota. 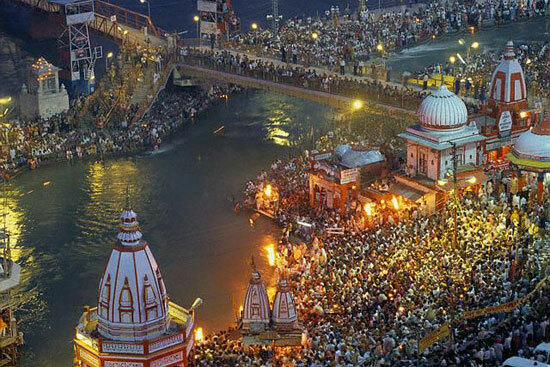 50 Million people were expected to flood the banks of holy river Ganges on this day to take the most auspicious ‘snan’, dip in Ganges. We felt very excited and energized by the very thought that, yes, we are here, blessed to experience Shivaratri at this most amazing spiritual gathering! Since we were told by the main Sidha Ashramite that there won’t be any program before breakfast at 8.30am, we took it easy and decided to get up only around 8am. Luckily, due to the sharpness of Mohanji’s sixth sense, he peeked out of the tent just on time to see the last person leaving the compound. He ran to ask how come all are gone, and was told that there was a change of plan and the whole group from Siddha Ashram just left for Kumbh Mela! I got ready within 1 min. and ran out of the tent in my slippers, unaware that 22km of walking was awaiting us that day. 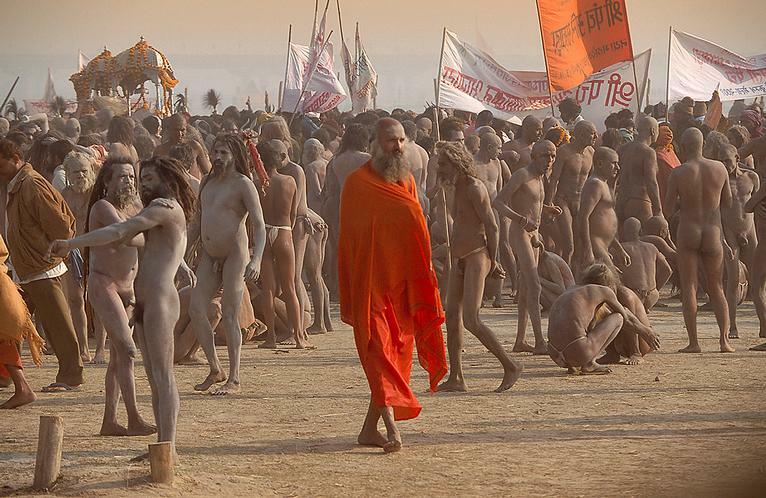 The walk towards the main area of Kumbh Mela was glorious – initially I felt a bit cold, but due to the brisk walk the body became warm very soon. The energy was oozing out of the body as we all sang and marched forward with radiant smiles. 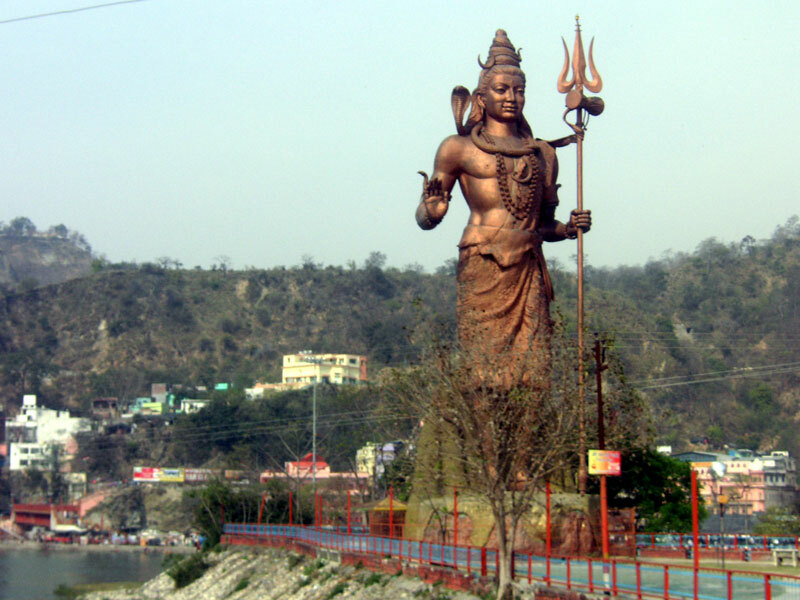 Haridwar has a very special flavor – especially the main bridge across Ganges and the main snan area. Such powerful vibrations! Rivers of people were flooding from all the directions, but somehow the experience was not as bad as I imagined it to be – hats off to the organizers! There was only one point when there was a lot of squeezing, pushing and shoving, but mainly all went smoothly. After some time, we witnessed a truly glorious spectacle – there was a long procession of Masters, all in chariots covered with flowers, with their disciples walking behind them in utmost humility. That was a sight to behold. At one point, our sweet Swami Yogananda suddenly appeared in front of us, clearly overjoyed to see us, especially Mohanji. We felt the same. He said that the chariot with his Master is soon to come. We all stood at the same spot on a side of that road when the beaming face of Swami Paramananda Giri became visible. At one moment he noticed Mohanji and myself and reacted so beautifully, with a delight of a child – even after his chariot passed us, he kept turning his head, smiling at us and blessing us profusely. We were simply overwhelmed! 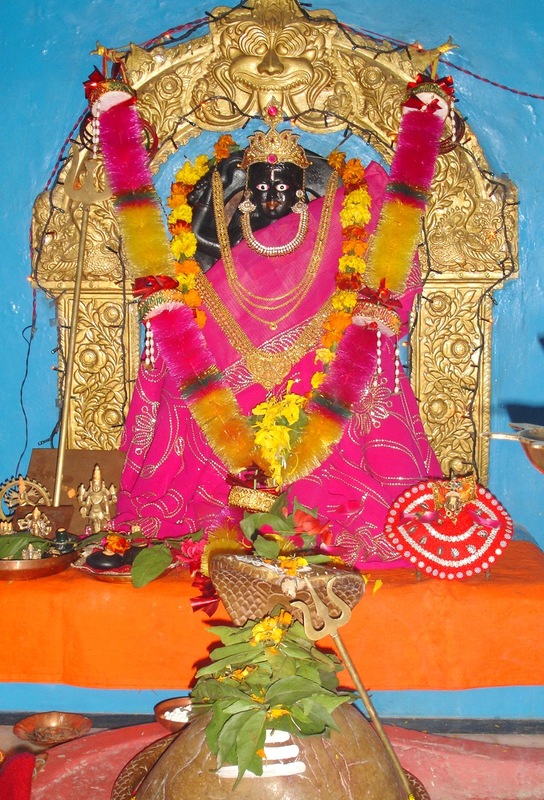 Mohanji advised me to establish eye contact with each Master, if possible, express respect, and be open to receive blessings – Shaktipat through eye contact is common with very high Masters. I soon experienced one such sacred moment – there was one Master (still don’t know his name) who looked at us and clearly saw something. He looked for a few seconds with razor-like sharpness and I could feel something happening within me, a great surge of energy. He then threw 3 candies right at us. I caught one and the other two were fought over by the people around me. What a blessing! I don’t think I was breathing throughout that entire procession – the experience was so wonderful, unforgettable. It was already mid afternoon when our snan time came. Our friend Krishna, who connected with Mohanji very deeply, told us about the best spot for snan that he discovered during the last four Kumbh Melas he attended. The water was clean and current not so strong, so one could even swim. I was overjoyed upon hearing that. Mohanji told me that during snan one should take minimum three full dips (with head under the water) in order to get the cleansing effect – however, the more dips, the better. Sure enough, the water was ICE COLD, but luckily at that point sun emerged behind the clouds and, as soon as I started swimming, the water temperature became bearable. While swimming, I took more than 20 dips and enjoyed the experience thoroughly! After changing into dry clothes, each one of us prayed and blessed Mother Ganga with a flower, imagining we are decorating her flowing hair with that rose. The sacredness and subtlety of this moment really touched my heart. Moreover, Krishna surprized us with Sai Baba’s vibhoothi which he offered to us to smear the forehead. What followed was even more unexpected and intense – Krishna then arranged for us to perform Pooja to Shiva Linga with Ganga gel (water) and Bilwa leaves. Mohanji told me that it is believed that each Bilwa leaf we offer to Shiva, reduces the sins/bad karmas of three lives. 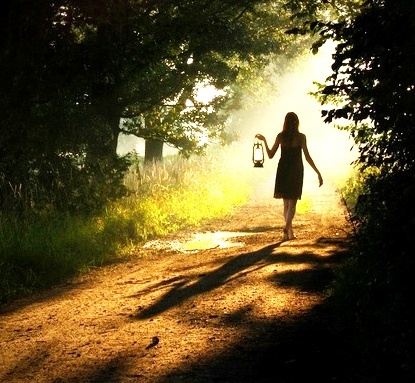 I really felt like a new person after the Snan – so much lighter, so energized and yet so calm. What a blessing! After performing the pooja, the poojari of that small ashram gave each one of us a special Prasad – a green fruit, similar to dates in shape and size, which is said to be the favorite fruit of Shiva. I have never seen or tasted this fruit before. We were so happy that we spontaneously fasted the whole day and this was the first food we consumed on this special Shivaratri – “All Divine plan”, said Mohanji. As we explored this small ashram on the banks of Ganges, we noticed a lovely statue of Dattatreya – Mohanji was overwhelmed. 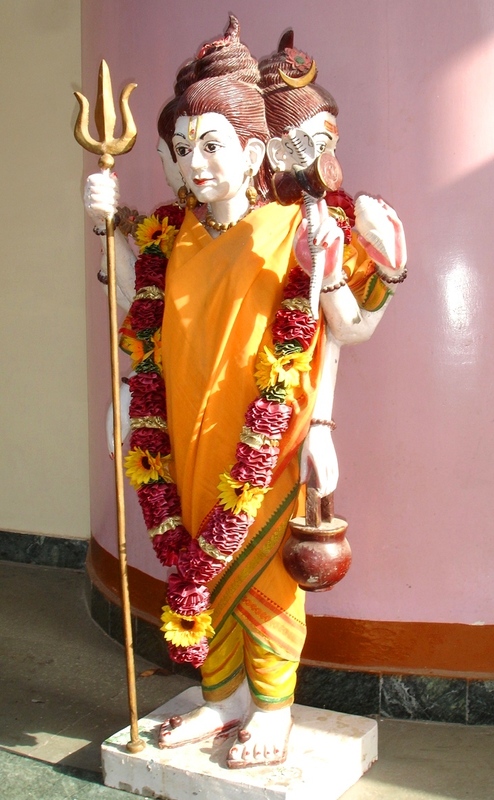 By that point, the Poojari seems to have developed a special liking for us and invited us to see the Swayambhoo Lingam (appeared by itself) and the special statue of Kali at their Shakti Peetam (the power centre of the ashram) – he offered to perform pooja for us at this special place, with prayers for each one of us (seven in total – for most of the French guests, lunch was more important than the Snan…). What divine experiences, all so unexpected! 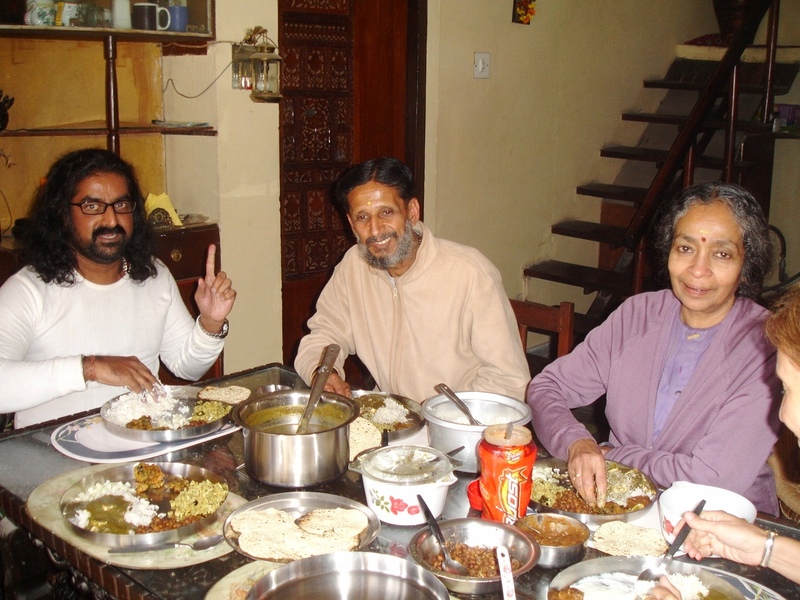 Upon return to the Siddha Ashram, we relished the taste of the best dinner ever (after a whole day of fasting and walking more than 22km, anything would have tasted just perfect!) and spent some time chatting with the French guests of the ashram. Some of them were very connected with Native Americans and were trained how to perform certain rituals. 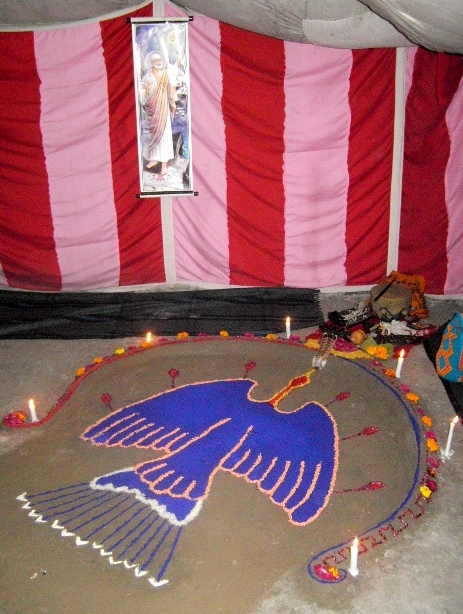 There was a special tent for that purpose only and we were surprised with the beauty of one image of eagle on the floor made out of grains. The crowning event of the evening was the unexpected Pooja to Shiva Linga that Swami Nardanand, with all of us participating actively, conducted in his tent around 10pm. What was even more unexpected was the sublime musical performance of our friend Krishna, who blew us off our feet with his voice and music. 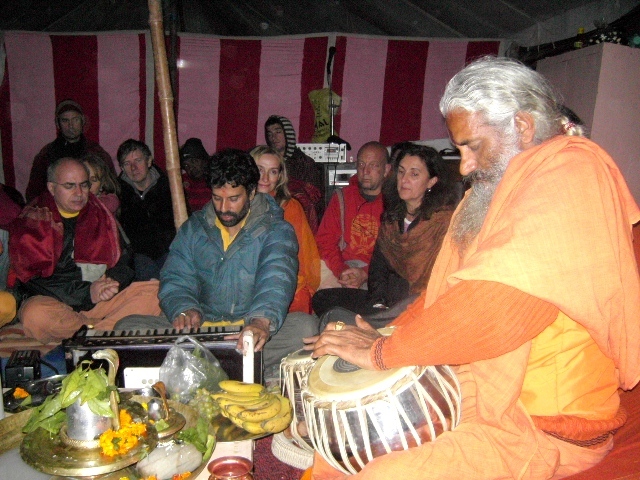 And then another huge surprize – Swami Nardanand sang one kirtan and started playing tabla! That was just too much. I knew that again we’ll be too energized to sleep :-). Our Quiet Swami Nardanand Surprized Us Again! We could not leave Haridwar without seeing Mohanji’s spiritual mother, Vanamali Amma, one more time – at sunrise time, we packed our bags quickly and left to Vanamali Ashram (in nearby Rishikesh). A few hours with Amma and Swami Mohanji were so precious – her ashram is on a small hilltop, overlooking Ganga and foothills of Himalayas. The view from her terrace and yard is breathtaking. I felt fully expanded basking in the light of the morning sun and enjoying this view. Everything about Amma is so pure and satwic that one can’t but be touched by her mere presence. She personally cooked a divine lunch for us, which we enjoyed as the most precious gift from the Almighty. Refreshed, we were ready for the 6-hour-long train ride back to Delhi, where two BTW meditations awaited us the following day. A radiant tall man welcomed us at the train station in Delhi around 11pm. Initially I did not know who he was, but after 30 min. or so understood finally that the person is Dipak Haksar himself – I was deeply touched by his humility. This was the last thing one would expect out of a top official of a successful establishment. 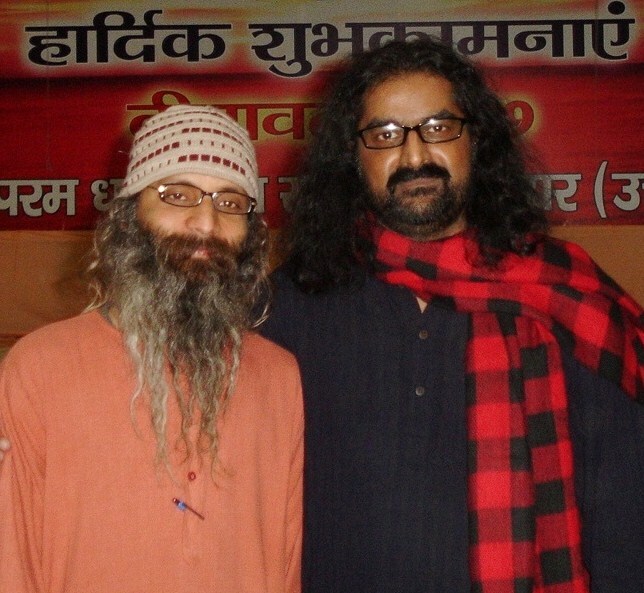 He really put his heart and soul into organizing two BTW meditations (in Delhi and Gurgaon) on Feb 14th. 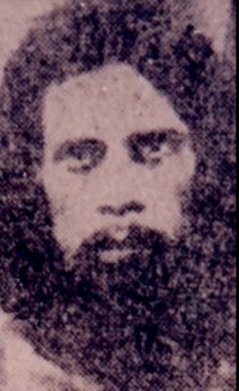 Moreover, all of this was done out of a ‘gut feeling’ since he never met Mohanji before, but, due to his previous sadhana and high sensitivity level, was able to recognize Mohanji’s stature from the moment he first saw his photo on mohanji.org website. 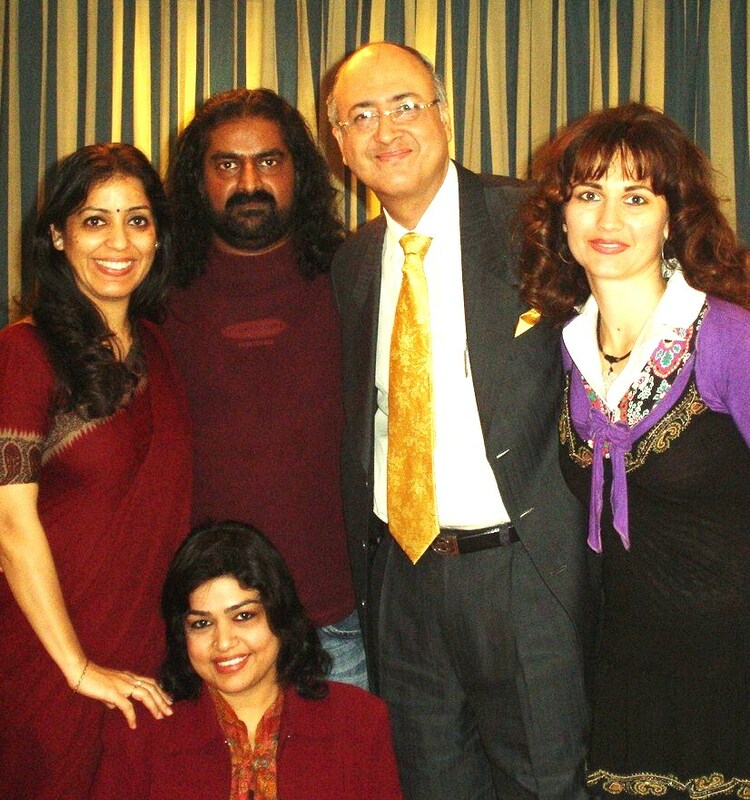 On Saturday, 20th Feb 2010, we experienced our first BTW meditation in Gurgaon, post Mohanji’s visit to Delhi. I must say it was such a wonderful experience to ‘feel’ for myself the wonders of this beautiful technique. The meditation was held at Mr.Dipak Haksar’s residence and I must thank him for having put all this together. It gave me an opportunity to get in touch with myself and get answers to some of the ongoing problems and the turmoil that each one of us go through in life. I distinctly felt the presence of Mohanji as if he was surveying each one of us and guiding us all along. While we received the Shaktipat from Mr.Haksar, there too Mohanji’s presence was very evident. What was strange was, though we were supposed to do the Power of Purity Meditation, somehow both the CD copies did not work and we ended up doing the 360 Degrees Meditation! It went so smooth and gave me a feeling of freshness and clarity. The FIRST BTW in Gurgaon after Mohanji’s visit was successfully conducted by Deepakji at his residence, which, I must say, is a holy abode in itself – I was highly energized at the very instance of entering the place! The whole setting decor and overall energy of the apartment truly complement the spiritual stature of Mr. Haksar, whom I was fortunate to meet for the second time thanks to Mohanji’s BTW. I don’t know whether I have the permission of Deepakji or not to say this, but I feel that who ever visits Delhi or NCR must visit Deepakji’s residence, which in itself is a wonderful centre of energy and divine power. I am very lucky to have attended this meditation and so grateful for gaining so many blessings from all the gurus, saints and the ALMIGHTY who indeed can be called by many names – Allah, Wahe Guru, Ram, Christ, etc. I hurried for the first BTW on 20 Feb, worried I’d be late, but reached Central park just in time. Deepakji started the session with the reciting of the OM/AUM mantra -this simple and yet so powerful Mantra harmonizes the physical forces with the emotional and intellectual forces. When this happens, one begins to feel truly complete. (It is for a reason that every Mantra in the Vedas, Upanishads and various religious traditions (sampradayas) within Hindu religion begin with Om or Aum – the primordial sound, the sound that is said to have its origins at the time of the creation of the cosmos – also referred to as the ‘Big Bang’). The CD used for this session was the longer version, as told to us by Deepakji – the voice of Mohanji and the music started to enrich us and slowly we let our mind and body sublime to the holy bliss and the UNKNOWN JOURNEY of inner awakening. I could feel the surge of energy when Deepakji’s hands touched me for Shaktipat and felt it even more strongly the second time when he gave all of us the second Shaktipat. 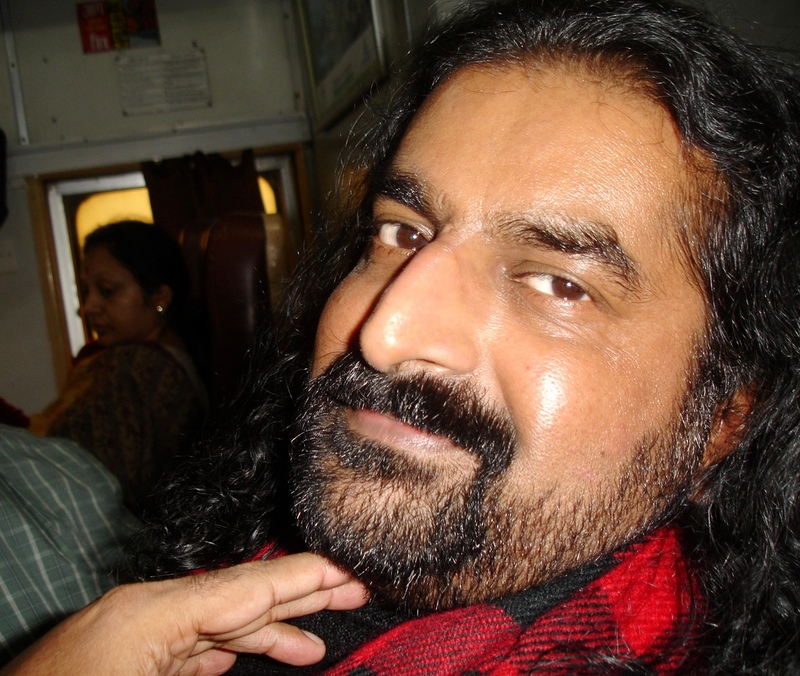 Novice as I am in this newly found spiritual journey, I felt the presence of many gurus – it was a divine experience and this time I was so engrossed that I felt as if I was in deep slumber, floating towards the sky, all the time aware of Mohanji’s presence. This was the longer meditation session than the usual one and, as Deepakji said, we were meant to take this session. As we all shared our experiences afterwards, like a nursery kid, I listened in awe to Deepakji when he explained about the ascendent and descendent gurus, about his own journey/path and blessings from the various gurus. We had the pleasure of talking with his daughter and wife too, who also shared their spiritual experiences. 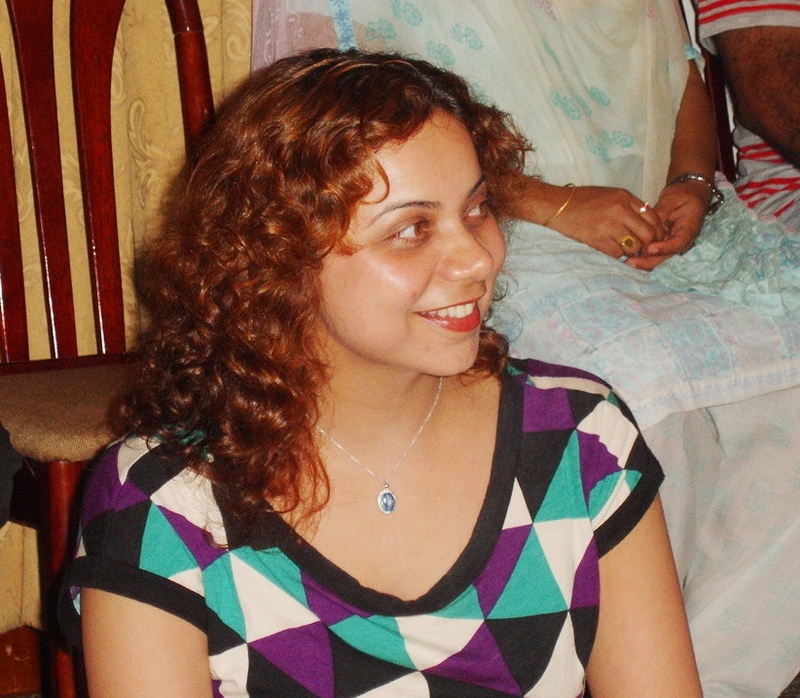 I returned home that day with the joy of being benefited emotionally, mentally and spiritually. Thanks to Mohanji and Deepakji, the whole experience brought me to realization that only through devotion, faith and constant guidance shall we be led ahead. Just as I love being present at the BTW meditation each Friday, I cannot resist sharing them when they are still fresh in my mind. Last evening’s BTW was like my first experience of BTW. After Pradeep took us through the breathing and centering, I was very still and calm, with deep concentration on the inner eye but I could hear my heart beating loudly near my left ear. Once the meditation began, I was following every single word of Mohanji’s guidance and did not travel anywhere but was very conscious of a gripping alert presence in the room. I went through a surge of gratitude for all my gurus, teachers, guides and mentors thanks to who I am where I am today on my journey. I was also very happily thanking my spirit angels and guides whom I have felt to be blessing my many thoughts and prayers lately. I was very grateful for saving both my nephews who were at the Pune bomb blast site last Saturday just 2 hrs before the blast, enjoying chocolate mousse at the German bakery. My heart was also overflowing with gratitude for the good news from the eye doc who informed me that my eye vision had improved, my number had decreased from 2.5 to 1.5(!) and besides, there was no sign of an early cataract that had developed in my right eye 18 months ago. I was thanking my gurus profusely for the tools of healing, EFT (emotional freedom technique), pranayama, and for the grace of all the divine Masters for this miracle which strengthens my faith further that our bodies have the ability of curing itself naturally, easing out any dis-ease. Pradeep is such a powerhouse of magnetic energy. Even before his hands touched me for Shaktipat, I felt a strong wave of energy pushing me and then hands clasped my forehead and back of the head as if to steady me. 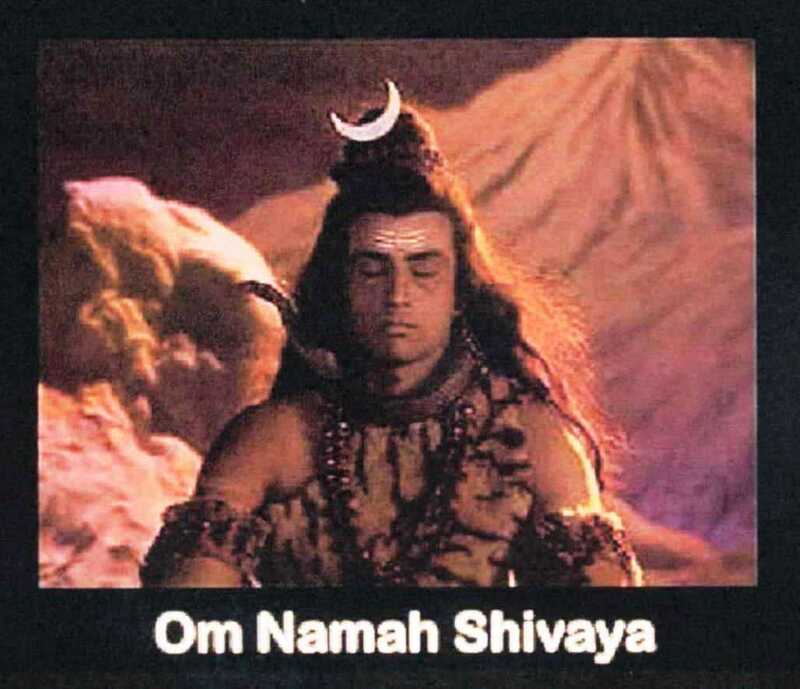 I knew this time that it was not only Mohanji, but the energy of many Ascended beings, Gods and Goddesses that he was channeling during the Shaktipat. When I received the second Shaktipat from Shernaz, as always I felt so fortunate to receive a second round of Shaktipath like a child receiving love from both the parents. 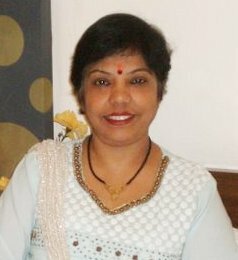 While blessing all my family and friends after raising the hand in the blessing position, the energy circulation was so electrifying that I could not help enjoying the sensations of circular movement in both my palms, receiving and sending out the light and blessings, being a conduit of His divine energy. When I was blessing the deities and the Masters, I saw the face of my sister-n-law’s guruji Shri Shri Krishnanandaji of Shakatapuram, blessing everyone in the room with his calm serene smile. Towards the end, while blessing myself, I felt a deep fulfilment and peace which reminded me of my first BTW experience six months ago. Thank you Mohanji for your love and blessings through BTW meditation which acts like a fresh shower washing away any impurities from our mental and physical states. With love & gratitude to everyone who makes the BTW meditation possible. Last Friday I had an eye problem, a sharp stem of a potted plant poked into my right eye while feeding food to the plants! When after a few hours the pain was still there and I could not focus properly, and could read double, I was in a dilemna as it was a Friday and clinics are closed. 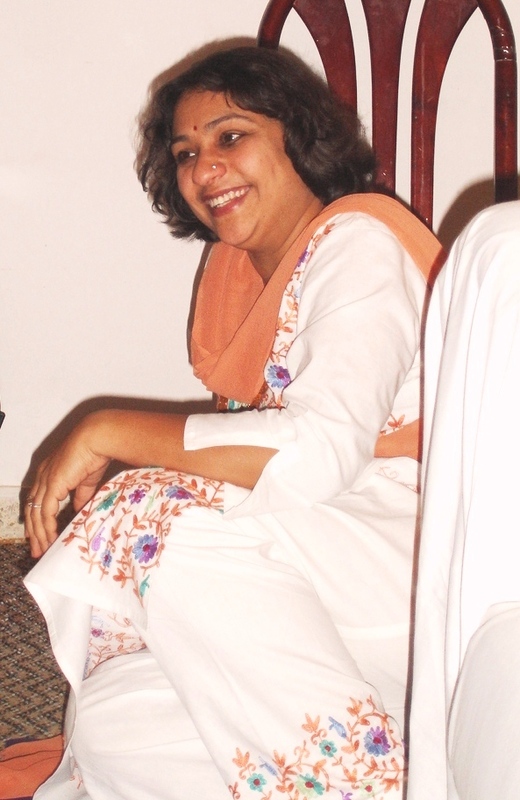 Fortunately, Shernaz’ doc was available with Divine grace! Not wanting health obstacles to come in my way, I decided to go for the BTW meditation straight from the clinic where the opthalmologist gave me some drops and medications. The BTW was very special that day, Mohanji was at the Kumbh Mela but with us throughout and Pradeep’s preparatory session was just awesome. When I received the first Shaktipat on my third eye, it was light and ice cold and I thought it was Shernaz, but when the pressure of the hand increased on the Sahasrara, I knew it was Pradeep. As the intensity increased, I saw Mohanji right above my head, giving me direct Shaktipat, stating my eyes would be perfectly alright and to let go of any doubts. I was whirling into a deep well of oblivion with the force of his energies, his face was very serious, not smiling, as if he was trying some magic and wanting it to happen. Much later, Shernaz’s loving hands soothed my nerves, like a healing balm, and I wanted to give her a hug then, for mothering me with so much love. After the meditation, Pradeep gave me some more healing on my eye and I could feel the pain sensation seeping out of my eye in waves as if someone was pulling out some transparent threads and clearing my vision. Thank you Shernaz and Pradeep, your beautiful healings had instant effect and I was cured 50% then itself, even before putting any drops! 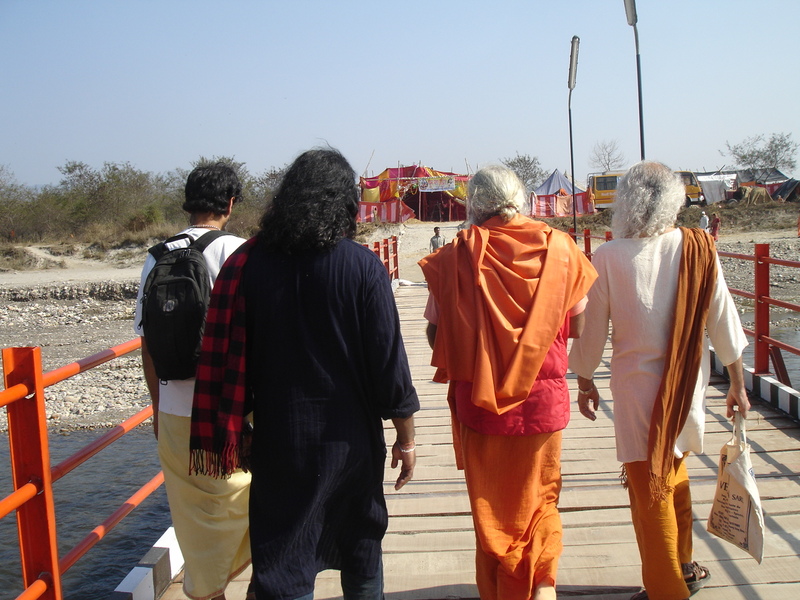 The Kumbh Mela Trip with Mohanji was definitely the most intense and most fulfilling trip of my life! So much happened during those few days – the intensity of the blessings that were poured on us, one after another, was beyond my wildest imagination! When we just started the trip, Mohanji told me that he received a telepathic message from Shirdi Sai that day. He said:” I AM TRAVELLING WITH YOU.” I was so deeply touched. And that, indeed, was experienced throughout the trip – we witnessed various signs of Baba’s presence at almost every step – from minor ones to mighty blessings that normally could never be experienced. It was great fun! The way our accommodation was arranged in the last minute was itself a miracle. 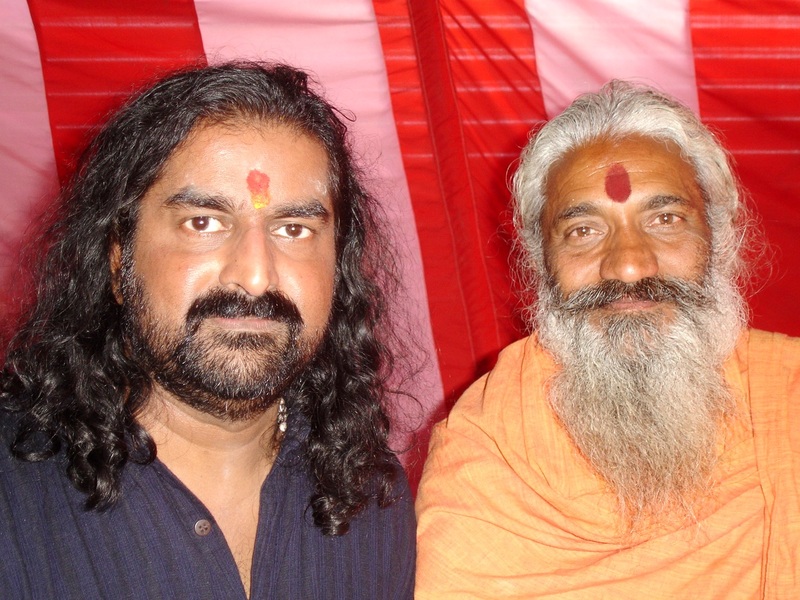 It was completely guided by intuition and aided by Dr. Pradeep Ullal’s connection with Swami Nardanand from Siddha Ashram. 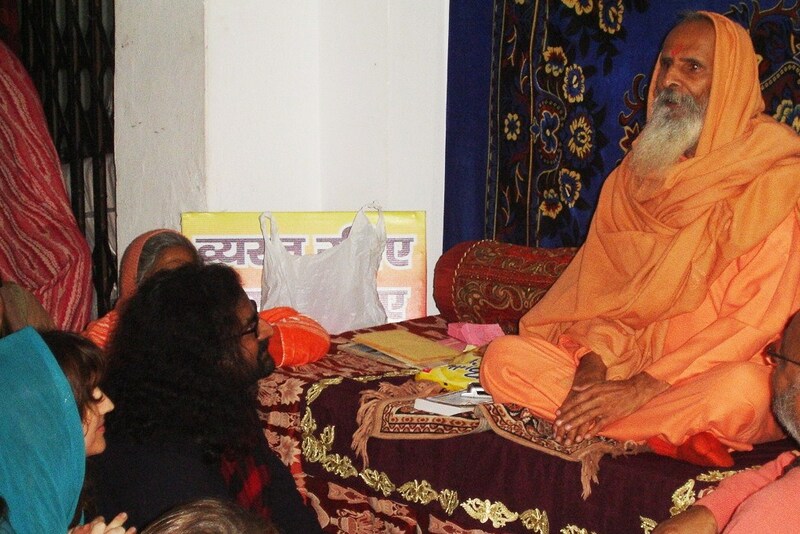 Even though this humble Swami never met Mohanji before, he told him he would be honored to host us at his modest/improvised Kumbh Mela ashram set up. I was mentally prepared for discomfort and ‘tapas’ – cold weather, tents, basic food, if any, poor toilet facilities, etc. And yet, I knew it was worth it! 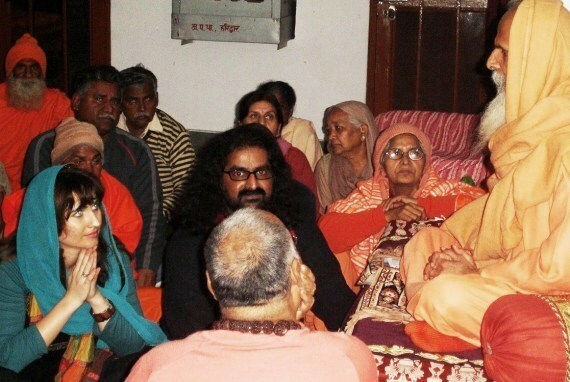 Second blessing happened as soon as we arrived to Haridwar – Vanamali Mataji (who considers Mohanji as her spiritual son -her beautiful ashram in natural surroundings is in Rishikesh, next to Haridwar) and her main disciple, Swami Mohanji, managed to reach the Train Station to welcome us. What a surprise that was! We heard that not even rickshaw will be able to move through the crowd and thus never expected to see them. They immediately took us to a restaurant for a lovely lunch – we were all bubbling with joy! It was so beautiful to bask in the glow of Amma’s eyes and enjoy her presence – what an auspicious way of starting our Kumbh Mela experience! The next blessing awaited us on the way to Siddha Ashram – we were wondering whether we’ll manage to find a rickshaw, and sure enough, soon one arrived – as we were entering, a small photo of Shirdi Baba glued was smiling at us from inside the rickshaw :-). I felt very excited and knew the whole trip will be a great adventure! 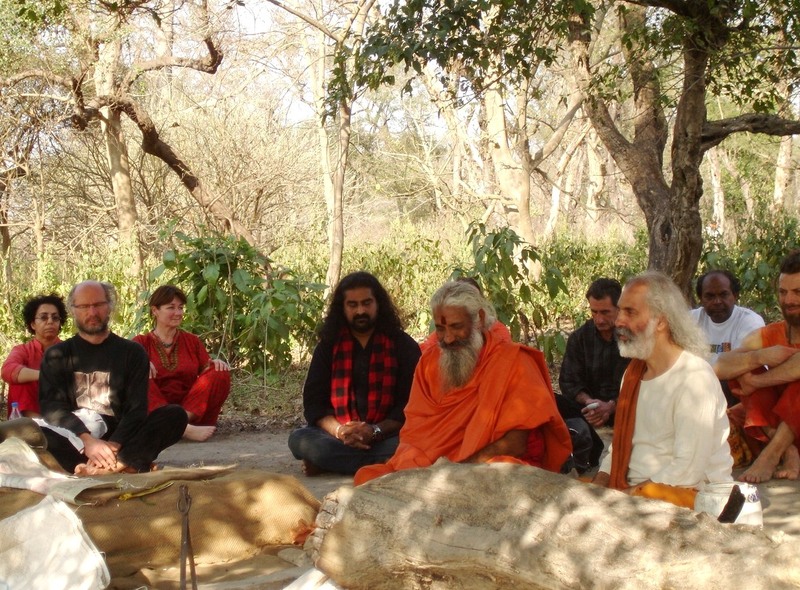 We soon arrived to Siddha Ashram and went straight into the tent of Swami Nardanand who gave us a warm welcome. He said that we arrived just on time as he was about to leave in order to take the group of Yoga practitioners from France whom he hosted for Kumbh Mela to see someone extraordinary. He said: “Today, if we are blessed, we’ll have a chance to meet in person a REAL AVADHOOTA. There are not many real ones out there. He is a fully realized being, a complete renunciate. He has no name, but some have named him “Langhoti Baba” because he always wears only that small cloth (Langhoti) to cover the intimate parts. He lives on a tree and mainly stays away from people.” Mohanji and I were overwhelmed – we arrived right on dot! Sai Ram! We just dropped the luggage and started to walk. Mohanji was mainly walking next to Swamiji and they were talking in Hindi. After 30 min. 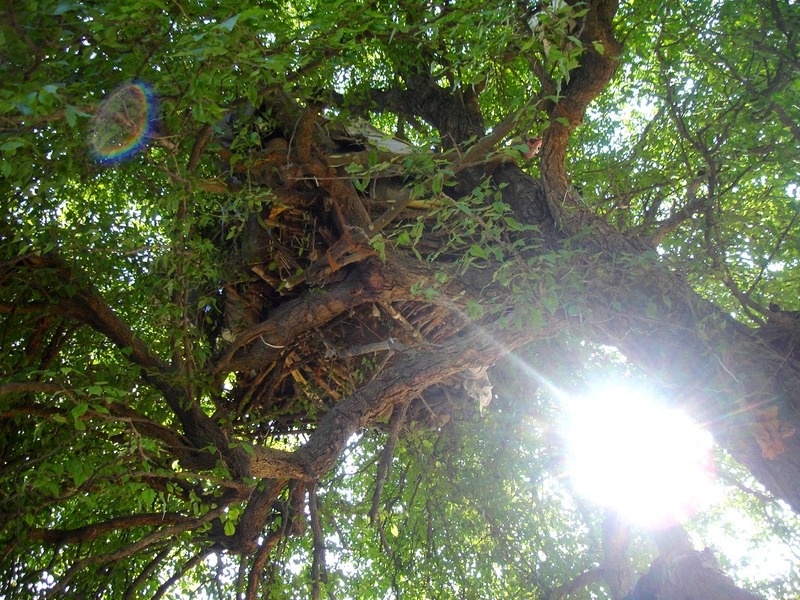 or so of a lovely walk in nature on the banks of river Ganges, we finally reached our destination and beheld, right before our eyes, a beautiful tree with the most peculiar accommodation unit improvised among its branches. I was really excited! Unfortunately, the great Avadhoota was not there – one local man who was waiting for him as well said that he must be taking a bath in Ganges and will hopefully come sometime soon. We all sat around the tree and meditated. The place was really magical. We prayed sincerely that he graces us with his darshan. Disappointment was visible on everyone’s face. Mohanji got up and started walking with Swamiji. I was somehow reluctant to go because I was so sure that I would see the Avadhoota that day. 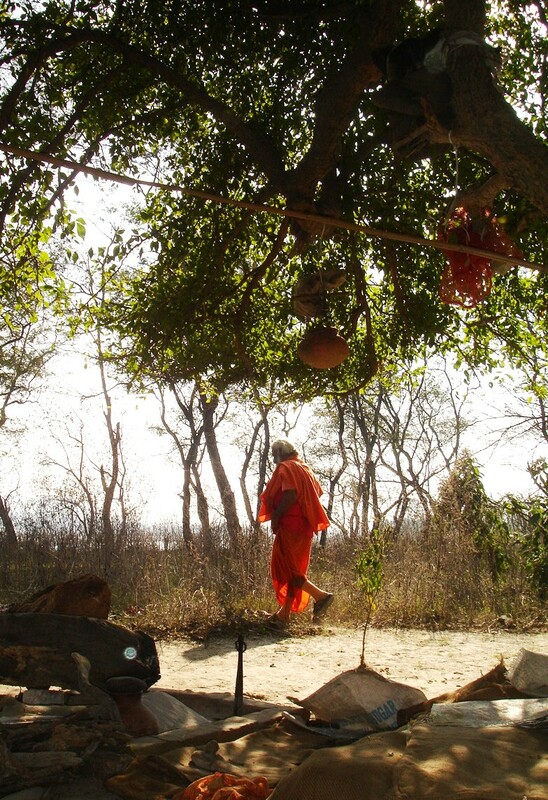 I was putting my sport shoes on, cleaning the dust from my trousers, observing the tree for a few seconds longer, and then, by the time I looked up, Mohanji and Swamiji were gone. 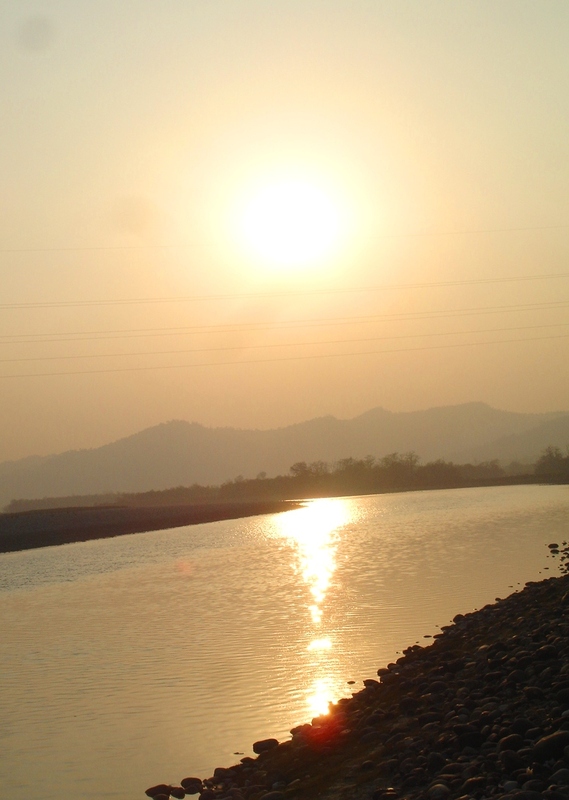 I walked towards the Ganges and looked in both directions, but could not see them. I had a strong intuition that I simply MUST find them! After looking intently for some more time, I suddenly caught a glimpse of Swamiji’s orange robe in the distance, in the direction opposite from where we came. That very instant I JUST RAN over the stones and bushes, as if I ran for my life, and soon reached Mohanji and one more man by the name of Krishna, who were trying to keep pace with Swamiji. Another 10 minutes or so of brisk walk through bushes, and suddenly we saw a group of five people sitting under a tree. It was the Avadhoota, right there in front of us!!! What a great blessing! A strong energy field around him ‘hit’ me immediately and I kind of lost my breath. His eyes were mainly half closed and he instantly reminded me of Lahiri Mahasaya’s (the great Kriya Yoga Master) expression. Avadhoota was very slim and youngish, with braided hair and nothing aside from ‘langhoti’ on his body. I sat next to Mohanji right away and bowed to the Avadhoota, deeply touched. I could hear him reacting to my bowing with a brief audible smile. I was so deeply touched that I could not think of anything nor convey anything telepathically –all I know is that my heart was beating SO HARD, as if about to jump out of the chest any moment. I knew from the past experiences what that meant – presence of a very high Master. It was a great honor to be in his energy field – I knew that only those who are eligible can have this experience, and felt so indescribably grateful. The feeling I once had during astral encounter with Mahavatar Babaji kept coming to me again and again – I had no doubt that this Avadhoota was experiencing the consciousness of Mahavatar Babaji. 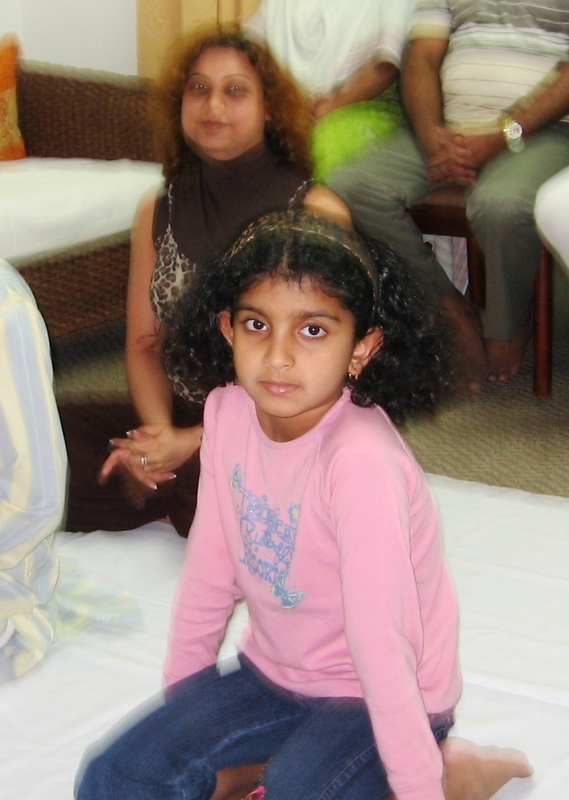 Even though I felt like keeping my eyes closed, after some time, I focused my attention on the Avadhoota. There was something so sweet and humble about his posture – he exuded the cuteness and majesty of a cat when it sits confidently and then wraps its tail around the body. 🙂 His skin had a beautiful glow and his purity touched my heart. 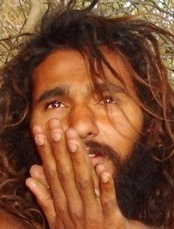 Our friend Krishna was the first one who spoke – he said in Hindi: “We are sorry if we are disturbing you”. The young Avadhoota smiled some more and spoke very little, in Hindi – later on Mohanji translated to me the wisdom pearls that he uttered – he was mainly referring to the being level and going beyond all the physical needs, beyond sadhana, notions of chakras, Kundalini, etc. (since I have not realized the meaning of those words through my own spiritual experiences, I will leave that part to Mohanji to convey to you, if possible). Mohanji spoke to Avadhoota several times and each time he turned his gaze towards us I felt shivers/current in my spine – the very glance of his eyes was a Shaktipat. The experience was overwhelming. At one point Swami Nardanand left to try to fetch his French guests. In the end, he managed to bring only a few of them, that too at the time when the Avadhoota was already fetching his stick, getting ready to leave. Out of politeness, he sat for another minute or so as the new people were arriving, but I could feel that his powerful vibrations were now completely withdrawn. In the commotion that ensued while the new visitors were getting seated, Swami Nardanand said briefly that it is OK to take a photo. I was feeling too shy to even reach out to the photo camera in my bag – it was just so inappropriate to even think about doing that without the Avadhoota’s permission. Mohanji then prompted me by saying: “It’s OK, go ahead.” As I was taking the camera, I prayed to this amazing Master to bless us with an image of his which will serve as an INSPIRATION to all spiritual seekers who will get to know about him. Since I was sitting to the right side of him, I was expecting to take a photo of his profile only. However, at the VERY SECOND when my camera clicked, he turned towards me, placed his hands in a prayer position and looked up. Tears came into my eyes when I beheld the priceless gift that he gave us – I knew it in my heart that he recognized the purity of our intention and thus gave us this one more final blessing. A second after this click, Avadhoota got up, and with a help of his walking stick, disappeared fast inside the bushes. I was speechless. I took a photo of another sadhu with a very long braided hair who was happy to pose for the photo, but the expression in his eyes was nowhere close to that of our Avadhoota. 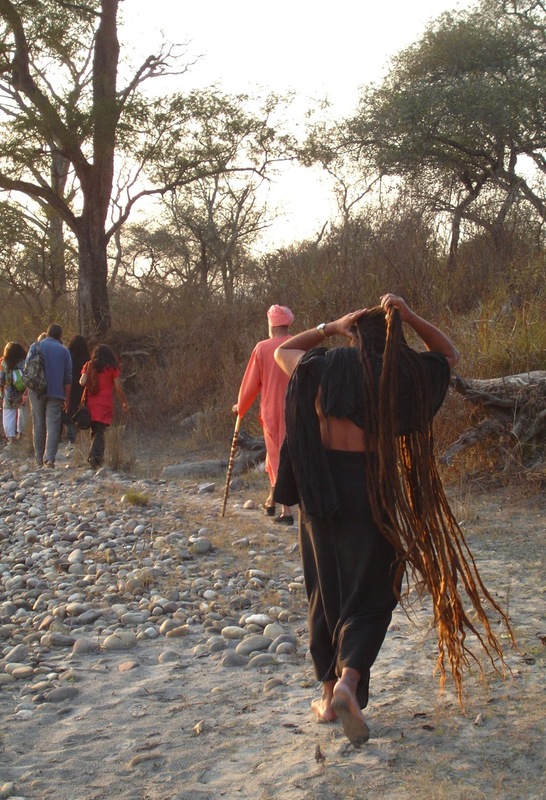 – with Shivaratri day and so many other experiences still ahead of us, I was looking forwared to taking a purifying dip in a river enriched by the vibrations of so many Great Masters like this Avadhoota over centuries. As we walked back to the Siddha Ashram camp, Mohanji told me that Shirdi Baba too was like this Avadhoota when he was young. He was found sitting under a Neem tree, immersed in bliss – nobody knew who he was, what his name was, and how he lived without food or shelter. I was glad that the young Avadhoota from Maharashtra grew into a giant of Shirdi Baba and became a beacon of Light and unconditional guidance to so many people till date. I wonder what will the future of our young Avadhoota by the Ganges river bring… Of one thing I’m sure – in which ever way the Universe guides him to serve, we are incredibly blessed by the very presence of such a being on Earth. What a divine situation! 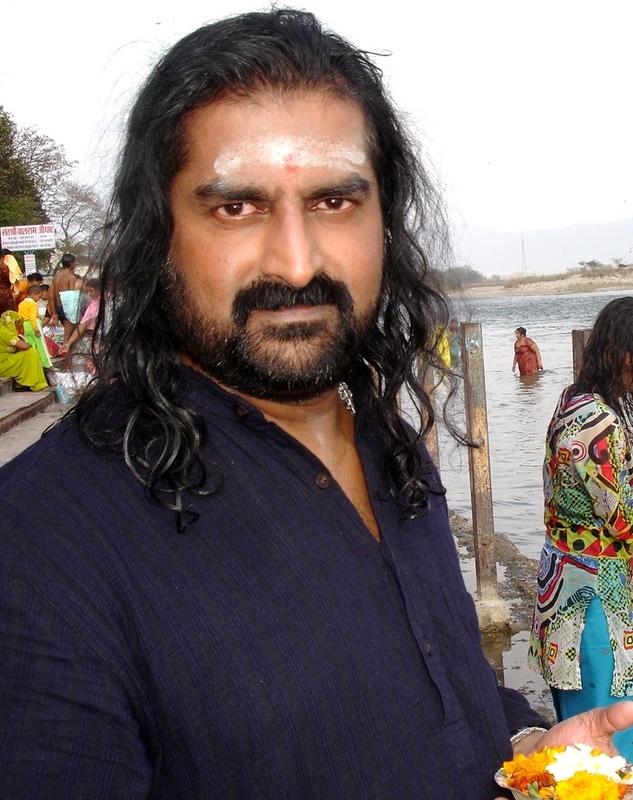 Mahashivaratri, Mohanji’s home, Friday and the day when Mohanji had his holy dip in Ganges at Kumbha Mela! 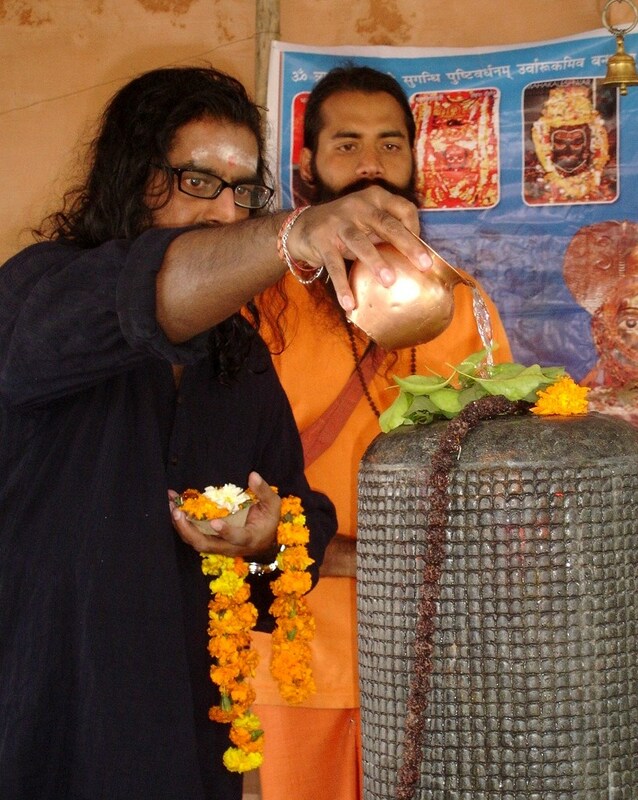 The meaning of Mahashivaratri is to awaken from the dark night, awaken the Kundalini shakti. 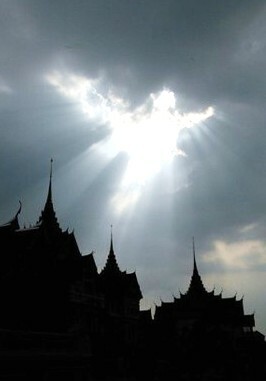 It was indeed a great honor to experience deep meditation on this Friday, 12 Feb 2010. This was my first time to conduct an independent meditation in Muscat (actually, I am just an instrument, not the one who conducts). I started with complete gratitude and surrender to Mohanji and Baba, and deepest gratitude for the energetic gathering of 15 motivated and dedicated devotees who accepted my new role. Dr. Kamlesh said that, during Shaktipat, he felt strong presence of Shiva himself. What a blessed soul you are Dr. Kamlesh! 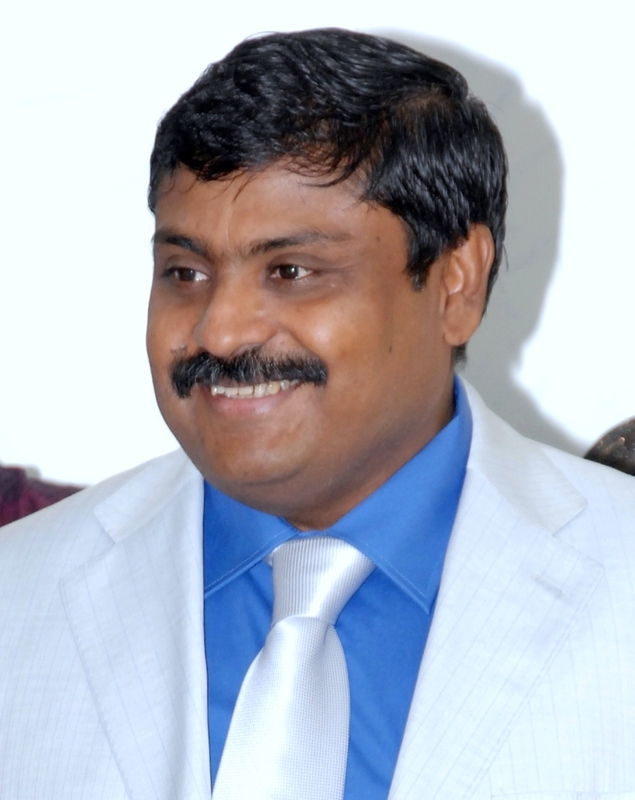 Prof Hassan…. His head expanded so much that he said he could not balance it. He also thought his body was splitting into upper and lower half….. later on, left side was going up and right down. He could barely drive home. Gitanjali also had a deep floating meditation. Everyone had their own unique experiences! When I was giving Shaktipat to Aditi, to my surprise, I could feel all her 7 chakras beautifully encircling the body. A beautiful blissfl tear on her left cheek added to her glow. While giving Shaktipat to Mohanish, I felt the energy body surrounding him. With Sanjay, I could feel the strong third eye connection between him and Mohanji! Everyone’s Sahasrara was warm and active. All received energy beautifully. What do all these energy experiences convey? Mohanji was not present there physically but everyone experienced him, felt him. 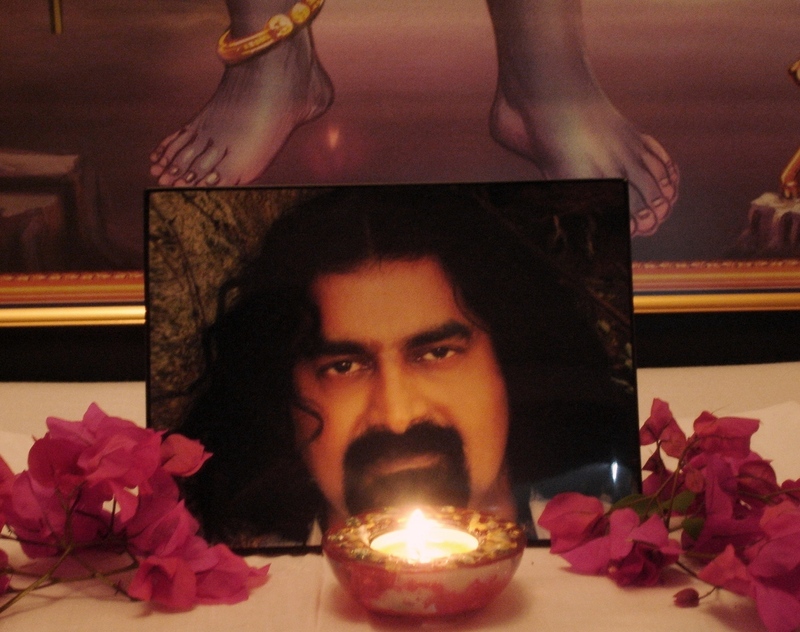 Though none of us saw him physically apart from his photo, he gave a beautiful ‘darshan’ to all of us in the meditative awareness. He is present and yet absent! Even though he is physically absent, we are still in his womb full of auspicious energy. The BTW meditations are simultaneously conducted at various places like Dubai, Kolkata, Germany, etc where Mohanji offers his grace astrally. Oh… Sai Baba, we are grateful to you for this strong experiences and understanding. Sanjay and his family had been to Shiva temple in Muscat prior to coming for the meditation. He kept coconut received from the temple in the Baba’s shrine. After meditation, the coconut was offered, the holy water was sprinkled everywhere in the house, and thus all had that sweet water and coconut. After reaching home, Sanjay continued his meditation till 3.30 in the morning. Would like to say a big thank you to Firoz who beautifully decorated the hall, and to thank Dr. Deepa who brought delicious Prasad in the form of potato cutlets and Thandai, the special drink of Mahashivarathri, that we all enjoyed. Yesterday’s BTW was sweet and surprising. Dr. Deepali and I agreed that both will perform Shaktipat and she asked me to ‘prompt’ her when the time is right for her to start. However, that was a mind’s decision which stood no chance once the real experience took over. After her Shaktipat I still felt intoxicated, but to a much lesser degree, i.e. I was able to get up and do my duty. I strong feeling of merging with all the recipients of Shaktipat made my heart expand. 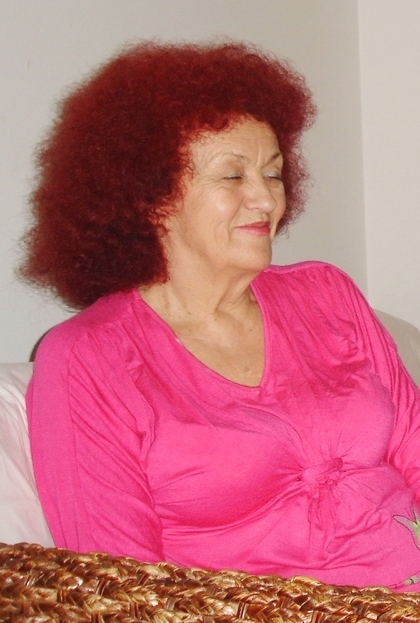 I started with Bery (Ma Grace), who came from Dubai as our special guest – I could feel her sinking blissfully to the ‘bottom of the ocean’, exuding great peace and calmness. Soon I reached Gitanjali, who, on the other hand, continued going upwards. She started breathing really deep and I could feel her astral body levitating. And then, at one point, I had a clear glimpse of her (looking much younger and radiant) floating in the Universe, with galaxies in the backdrop, much beyond our planet. This is the first time I saw something like that, that too so clearly! Later on she confirmed that that is exactly what she felt – she was simply radiating and could not contain her joy! I continued with the Shaktipat task and soon performed Shaktipat for Vinod and his wife Priti, both at the same time. I could feel them individually but also as a couple – beautiful, loving rays of bonding were flowing between them, and they were both very receptive. Vinod told me later on that before Dr. Deepali and I gave him Shaktipat (which felt very warm), he also received one COLD Shaktipat on the third eye at the very beginning – he could feel it clearly and the experience it gave him was wonderful. I was so pleased with his sensitivity level and confirmed that, indeed, that was Mohanji who was giving Shaktipat to all of us astrally. 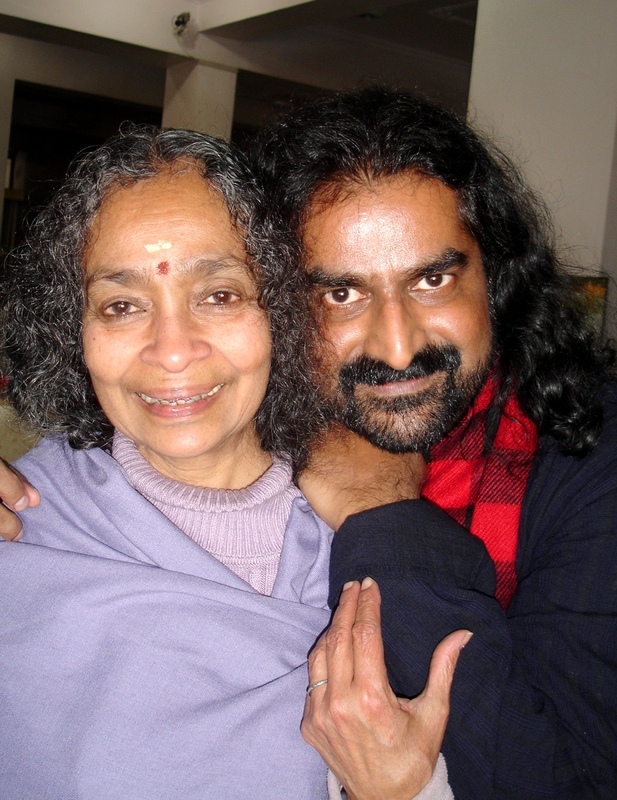 As I said before, it is wonderful to have Mohanji with us physically, but there is a point at which we have to grow to experience him (and the Masters that work through him) at a much deeper level, i.e. reach a point at which the subtle frequency of the higher realms becomes our tangible experience. All in all, yesterday’s BTW was truly enjoyable, especially for me, because it crowned an already amazing day spent in a continuous inspiring conversation/experience sharing with Bery, a dear friend and one of the greatest artists and spiritualists I have ever met. Her artistic name is Ma Grace, which truly suits her because she is like a loving mother to all, has served selflessly for many years, raising endless funds for orphan children across the globe, and continues to touch many people’s live through her ‘healing through art and joy’ workshops in which many people, especially women dulled by routine life, realize just how much life energy we all have and how it feels when it flows and expresses as joy and creativity. 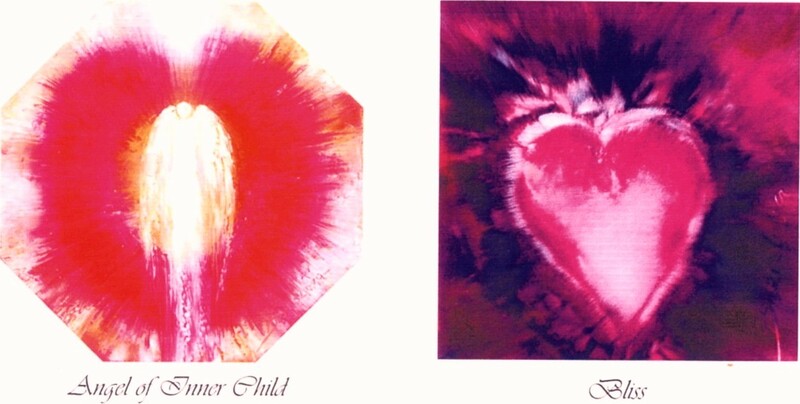 Moreover, Bery’s paintings literally radiate energy and have a healing/harmonizing effect. This kind of grace can be earned only after one braves many tests of life and proves worthy/eligible to receive it. To see someone of her age being as light as a child, living on her own, across the globe, with no guaranteed material income, is a true inspiration. May our world be blessed with more people like Ma Grace who are ready to live their passion/life’s purpose courageously, with the HEART OPEN and vulnerable, at all times. Keep The Flame Alive - No Matter What! Let me share my thoughts and personal experiences that are continuously happening by the mere presence of Mohanji, a precious gift of Divine to all of us who have the great fortune to be around Him! My wife Shampa, who came to visit me here in Muscat for some time, needed Baba’s help and protection to come out cleansed from many lives Samskaras, which continue to give her a lot of mental and emotional anguish, as well as physical pain. I just had to request Mohanji. At first I thought I will visit Him after work along with my wife. In spite of his very busy professional schedule, He accepted to visit my home instead and bless us. This is only possible with great compassion that oozes out of enlightened state of the Master. We were all touched by His immense compassion, unconditional love and great humility! Shampa normally feels strongly connected with Jesus and Shirdi Sai Baba only and is not willing/able to accept any other form as her Master. Spiritual workshops and retreats do not appeal to her either and I did not really know how to help her. The first great surprize happened the moment Mohanji walked into our house – I was amazed to see Shampa touching Mohanji’s feet, which is something she would never do just like that. She was instantly receptive to Mohanji’s energy. After the Shakipat Mohanji gave her, she underwent a deep cleansing experience and felt very light and fresh. I could see her aura totally changing in front of me – she was glowing! She felt completely dissolved in Mohanji’s energy field. It was amazing to see Mohanji ‘downloading’ the messages from Shirdi Baba for Shampa right before our eyes. We all felt tremendous presence of Shirdi Sai and Jesus, and were deeply touched by their love. Baba said, through Mohanji, that He is always protecting my wife. He said that whatever she needs in this life has been given to her and no big spiritual sadhana is needed. Her illness itself is her cleansing. Furthermore, Baba said that He has already appeared to Shampa physically and she knows that, but still does not have enough faith. She must always be inviting life, with faith in Baba, and not invite sickness and death. This way she will reach great heights in this life itself. 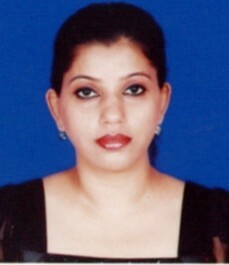 At the same time, even I received Jesus’s communion – He said that Shampa is getting “life solution” today! I am sharing this in deep gratitude to the Masters who are so compassionate and unconditionally loving. This is a great miracle in our lives, enough to take us to the enlightened state, the state of ‘Nithyananda’ in which all enlightened Masters live. We need Masters’ grace and blessings to attain the ultimate. Spiritual practice alone won’t help. Therefore, the gratitude has to flow naturally, from the heart, before we can experience the Grace. Masters have no bias, their grace is always flowing and always available – the bridge that is to be built from our side is our gratitude… I say this out of my personal experiences with several Masters. Mohanji , we bow to you with deep reverence, honoring your Enlightened state, Shiva state of consciousness.